At Absolute Pools, we believe that every aspect of interacting with your pool should be a pleasurable experience. That’s why the right automation system is key. And our favorite system is the Hayward OmniLogic. While every luxury pool doesn’t need a high-end control system, we especially recommend the OmniLogic for our clients with spas, water features and elegant outdoor living areas. First, we program a custom interface for each of our pools. Then we connect your pool control system to your iPhone, iPad or Android, as well as desktop. Finally, we teach you how to use it, but it won’t be long before total control of your pool is at the touch of your fingers. Control your pool from anywhere in the world with an internet connection. Headed home from overseas and can’t wait to slip into your spa? No problem. Effortlessly turn on the heat in time for your arrival. Control individual items as you want, or create custom themes like “pool party” or “romantic evening,“ and transform your yard with the touch of a button. OmniLogic can do so much more than give you the best user interface to control your pool. Designed to be salt-ready, and compatible with Sense & Dispense, let OmniLogic keep your chemicals perfectly balanced. Easily set schedules and maximize energy efficiency for cleaning and filtration processes. OmniLogic is designed and engineered to advance with automation technology. The system’s unique architecture allows for effortless access to the latest software upgrades, new capabilities, or even restoration of previous configurations. OmniLogic also has the ability to integrate with select home automation systems. 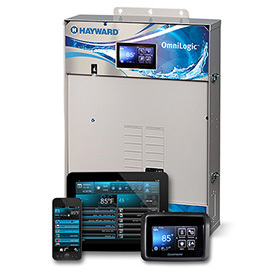 So for our tech savvy clients who want the best in swimming pool automation, we are proud to use Hayward’s cutting edge OmniLogic. Click below for more information, or call Absolute Pools today to find out how to turn the pool of your dreams into a reality.